Supplementary material reads: "Photo assignment for Tuesday July 1 at 3 p.m. Pls. 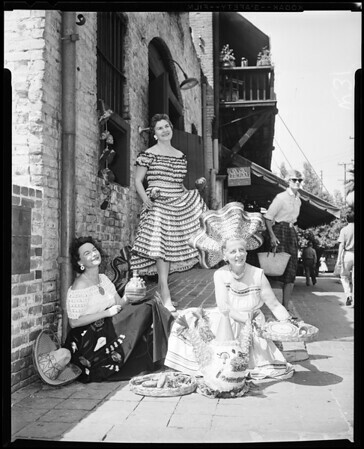 go to Olvera St., front of La Golondrina Cafe, meet Mrs. Hill of Bib and Tuckers of Assistance League, get shots of women planning merienda party. Three cols., candid, Mexican props, animated, unaware of camera. Contacts Wednesday. Thanks, Carter Ludlow".